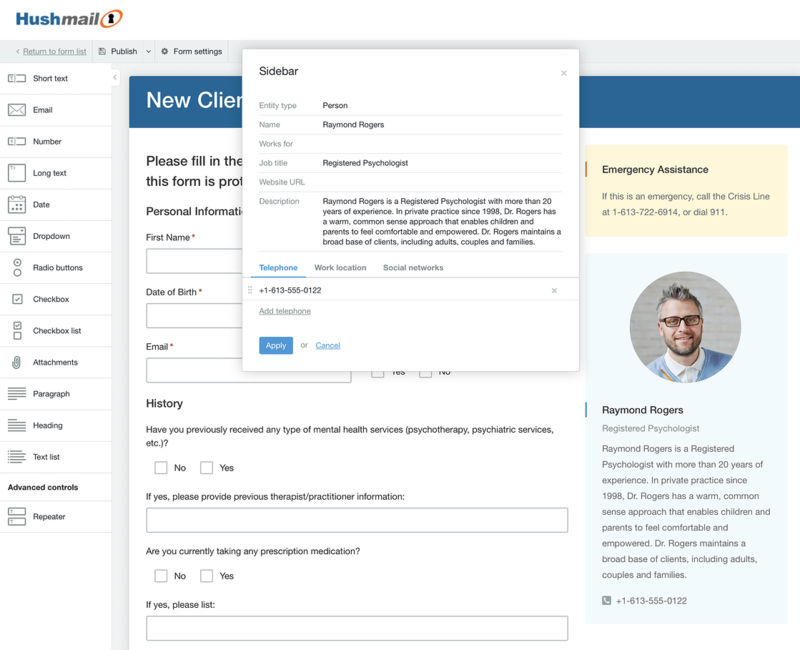 When it comes to building a customized, secure web form, it doesn’t get any easier than using the Hush Secure Forms drag-and-drop form builder. It’s possible to create a form from scratch and publish it to your website, social media page, or email signature in a matter of minutes. To ensure you get your form up and running as quickly as possible, here is a helpful guide to the basics of web form building. Before you do anything else, decide the purpose of your form. Are you welcoming a new client? Is it a depression questionnaire? Are you conducting a survey? Once you establish what you're trying to accomplish, you’ll be able to come up with a great title that clearly tells your client what the form is about. The first text field at the top of the drag-and-drop form builder is your form’s title. Just click in the field and start typing. You can make your title as long as you like, but ideally, it should be concise and fit into one line. For example, New Client Questionnaire (Adult) or Client Experience Survey. When you start your form, go ahead and get the basics out of the way up front. Drag and drop fields for your client’s first and last names, phone number, email address, and date of birth. If this is information you need in your database, be sure to mark the fields as Required. Hush Secure Forms gives you the option to mark any field as Required. This means your client will have to include that information to submit the form. However, it’s important to be judicious when considering what information you absolutely must have. Some clients might feel uncomfortable providing certain information and stop filling out the form. Commonly required fields include name, contact information, and date of birth. Hush Secure Forms provides you with various ways to communicate and collect information. You can try checkboxes, drop-down menus, and radio buttons. Play around until you find a look that’s both appealing and functional. 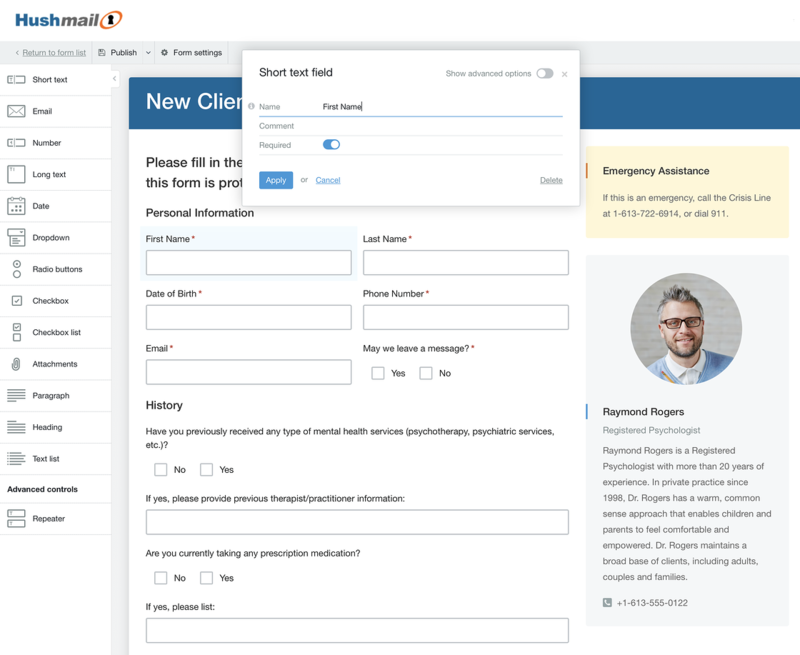 Hush Secure Forms gives you plenty of space on the right side of your form to introduce yourself with a picture, bio, social media links, and anything else your clients might like to know. We advise that you make use of all the fields offered, so you can give clients a clear picture of who you are, what you care about, and how to reach you. Want to try Hush Secure Forms? 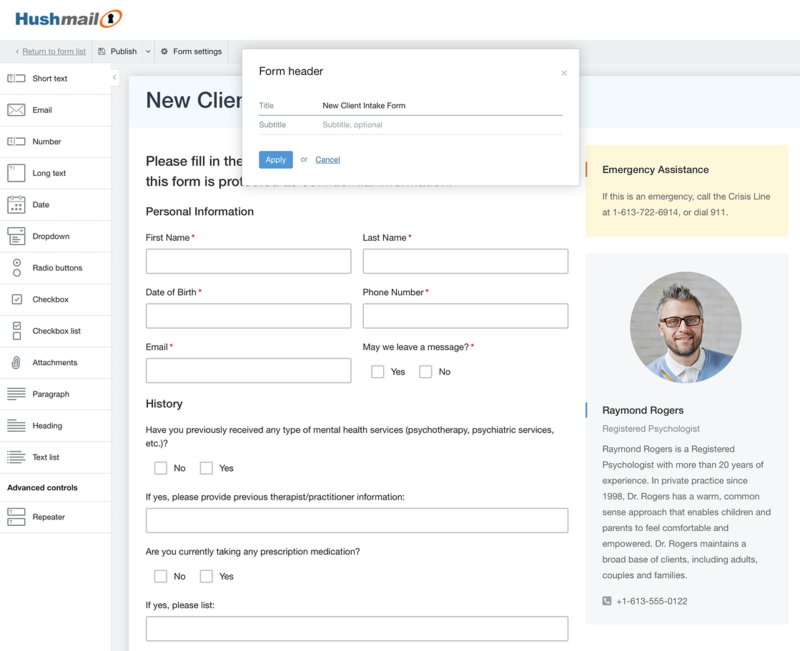 For a $9.99/month subscription to Hushmail for Healthcare, you’ll receive two secure web forms with an encrypted email account and 10 GB of storage. It’s easy to increase your subscription level so you can build more forms as your practice grows. Sign up for Hushmail for Healthcare today and try it risk-free for 60 days. Not in healthcare? Contact our sales team.